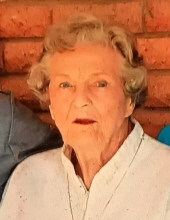 Funeral services for Sue Montgomery, 89 of Athens will be held at 10:30 A.M. Wednesday, February 6, 2019 at Autry’s Carroll-Lehr Funeral Home with Dr. Joe Warren officiating. Burial will follow at Athens Cemetery. Mrs. Montgomery passed away February 2, 2019 in Athens. Eva Sue Montgomery was born November 28, 1929 in Ranger, Texas. Her family moved to Trinidad where Sue graduated from Trinidad High School and later attended Henderson County Jr. College in Athens. She retired from the Henderson County Auditors office as assistant county auditor after serving 38 years with the county. She enjoyed her grandchildren and friends. She was active in the Daniel McMahon Chapter- Texas DAR and the Trinidad ISD Ex’s Association. She was a member of the First Christian Church-Athens. She was preceded in death by her husband of 61 years, Robert Montgomery, sisters Geraldine Harris and Patsy King. Survivors include her children Vicki Conner and husband Charles of Palestine, Monte Montgomery and wife Lisa of Athens. Grandchildren include Michael D. Montgomery and wife April, Stephen Till, Travis Dunnam and wife Valerie, Traci Mersiovsky and husband Steven, Weston Montgomery, Trent Montgomery and wife Lauren and step grandson Chuck Connor and wife Tonya. Mrs. Montgomery had a niece Kay Tiblets, nephew Ray King and numerous great grand- children. Pallbearers will be Doug Montgomery, Stephan Till, Travis Dunnam, Weston Montgomery, Trent Montgomery and Tate Cleveland. Honorary pallbearer is Traci Mersiovsky. Visitation for family and friend will be held Tuesday evening from 5:30 to 7:30 P.M. at the funeral home. The family would like to thank Oakwood Assisted Living and Dr. Terri Eckert for their amazing care and the comfort they gave. In lieu of flowers, the family would like donations to be made in her memory to the East Texas Arboretum of Athens 1601 Patterson Rd. Athens, Texas 75751. "Email Address" would like to share the life celebration of Sue Montgomery. Click on the "link" to go to share a favorite memory or leave a condolence message for the family.